Laminated veneer lumber (LVL) is manufactured by bonding layers of wood veneers together under heat and pressure using a waterproof adhesive. Having the grain of all veneers run in the same longitudinal direction results in a product that is strong when edge loaded as a beam or face loaded as a plank. It is imperative to design LVL beams to the right size in order to create a safe structural system. However, beam spans are only estimates. Any accurate calculation of beam size must take into account the tributary load area for a beam, based on its spacing and the magnitude of load being carried. 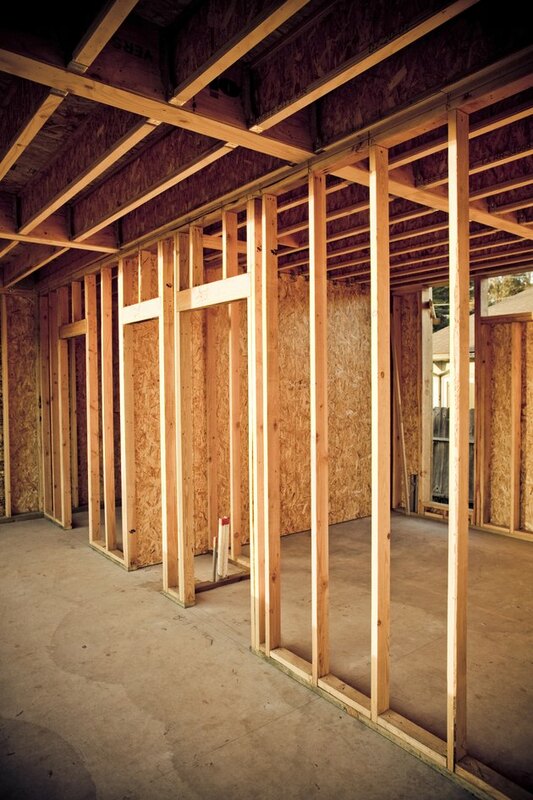 These are all variables that cannot be addressed as they are project-specific and would require calculations that are specific to the location of the construction -- moisture and weathering variables -- as well as type of wood being used. Ultimately, there are hundreds of variances of this calculation. LVL beams have large spanning capabilities. Ensure that your vertical support members, typically heavy timber columns, can support the beam that will be spanning between them. There is always the factor of self-weight of the beam that will bear down on the columns. Similarly, there are precise calculations to be done such as slenderness ratio and moment of inertia whenever designing a structural system. Measure between the two vertical members that you will be designing the LVL beam for. Remember to always measures "on-center" when measuring between structural members. This refers to measuring between the centroids of each column or similar vertical member. Ensure you have evenly spaced your columns and have anchored them securely into your foundation. Make sure your columns are the exact same height because the beam that spans between them can lose efficiency. Measure your total span between members and ensure that it is not greater than 60 feet. Because of transport limitations, the maximum standard length for manufactured beams is sixty feet. Design a beam width based on the fact that the typical width of an LVL beam is 1 3/4 inches. The width can be increased by laminating in multiples of 1 3/4 inches. Beam width should be 1/4 to 1/3 beam depth. Design a beam depth based on the rule of thumb for estimating the depth of manufactured beams which is to divide the span by 20. Beam depths are typically 5 1/2 inches, 7 1/4 inches, 9 1/4 inches, 11 1/4 inches, 11 7/8 inches, 14 inches, 16 inches, 18 inches, and 20 inches.